Italian painter, draughtsman and printmaker. His early art drew on a variety of sources, which included the naturalism of Rutilio Manetti and Francesco Rustici, the descriptive realism of the engraver Giuliano Periccioli (d 1646) and the Baroque of Raffaelle Vanni. Mei s interests even embraced 16th-century Sienese art. This stylistic variety is evident in his first known works, such as a bier (Casole d Elsa, Collegiata), three signed miniatures in the Libro dei leoni (1634; Siena, Palazzo Piccolomini, Archivio Stato) and frescoes of scenes from the Life of St Bernard (1639; Siena, oratory of S Bernardino). His experimental approach is also displayed in such works as the Annunciation (Siena, Seminario Montarioso), which may be dated between the mid-1630s and the early 1640s. Mei s early maturity is marked by a conscious return to the naturalism of Manetti, enriched with a Baroque pathos and soft, fluid brushwork, as in the St Peter in Prison Awoken by the Angel and St Peter Freed by the Angel (both Siena; Conservatori Femminili Riuniti). Bernardino Mei had the good fortune of being patronised and favoured by Fabio Chigi, later Pope Alexander VII, who belonged to one of the most powerful families in Siena, the artist s native city. Chigi was elected Pope in 1655 and two years later summoned Mei to Rome, where the latter joined the Accademia di San Luca. 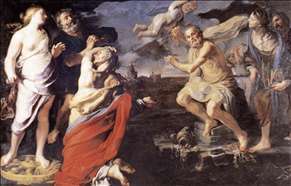 Whilst in Rome Mei executed a number of paintings, of a religious and allegorical nature, both for the Pope and for his nephew Cardinal Flavio Chigi. 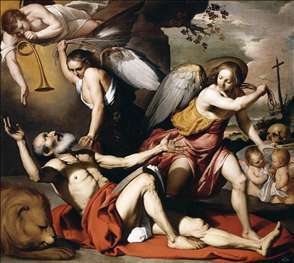 See more details about "Allegory of Fortune"
See more details about "The Vision of St Jerome"